It makes perfect sense that the state’s top banking regulator has a background in history as well as legal and financial expertise. 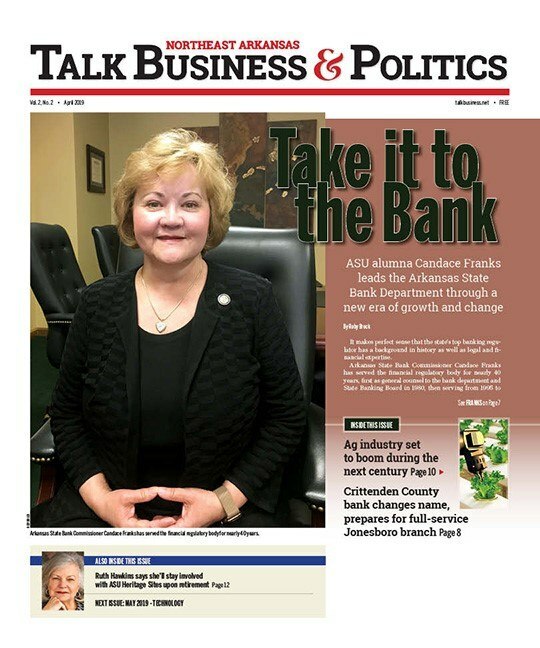 Arkansas State Bank Commissioner Candace Franks has served the financial regulatory body for nearly 40 years, first as general counsel to the bank department and State Banking Board beginning in 1980, then serving from 1995 to 2007 as Deputy Commissioner and General Counsel. She was named as the 21st commissioner in 2007, the first female and the first professional bank regulator appointed to her position. The daughter of a doctor in Jonesboro, Franks earned a Bachelor of Arts in history and a master’s in American history at Arkansas State University in Jonesboro before receiving a Juris Doctor degree from the University of Arkansas at Little Rock School of Law. In an industry that often cycles through familiar boom and bust periods, Franks may be the perfect watchdog to keep certain history from repeating itself. Nearly a decade after the financial crisis that led to the Great Recession, Franks’ banking department supervises 79 state-chartered commercial banks with total assets over $100 billion. 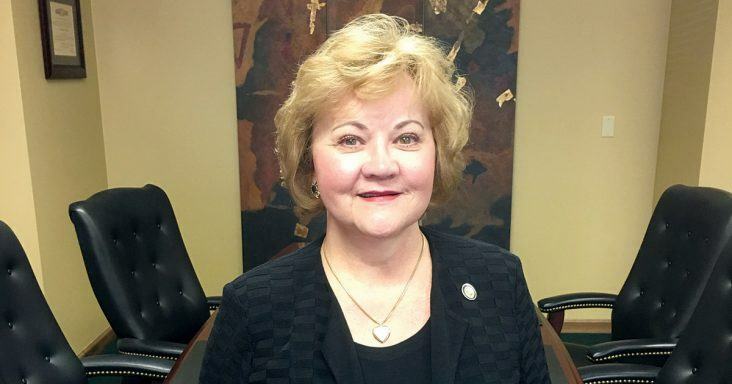 Her responsibilities include the regulation, supervision and examination of Arkansas state-chartered banks, bank holding companies, a trust company and Arkansas Capital Corporation. She served as Chairman of the national Conference of State Bank Supervisors in May 2014 to May 2015. As Chairman Emeritus, Franks continues to serve as an ex-officio member of its board of directors. Franks met with Talk Business & Politics CEO Roby Brock to discuss the growth and health of Arkansas banks and a rising trend of ownership changes and recapitalization. This article first appeared in the latest edition of Northeast Arkansas Talk Business & Politics. Roby Brock: Recent headlines in Arkansas banking are focusing on smaller banks expanding, getting new management teams, re-capitalizing institutions. What do you see happening in the banking landscape in Arkansas today? Candace Franks: I continue to see, and I expect to continue to see, mergers, consolidations and acquisitions. Obviously, the economy has improved, so I think that a lot of investors in the smaller institutions are looking for other places to partner. Perhaps, maybe looking for some higher growth areas from those areas that are low-growth areas. In the smaller banks, I can tell you that generally what is the impetus for this is generational change. We’re seeing a lot of that as far as the effects of those institutions wanting to look for new ownership or new partners. In a lot of those smaller institutions, we have closely-held ownership and sometimes the family doesn’t want to come home or doesn’t want to come home and run the bank, so it’s time for the institution to look for new management. Franks: That’s exactly right. That’s not unusual for Arkansas. I’ve talked to fellow commissioners throughout the country, and I think that’s real typical of what you’re seeing throughout the whole country. You have a small institution in a rural area and you just don’t see the family coming back home to run the bank. A lot of times that generation is looking for a new opportunity for the institution and in a way for them to retire. Brock: If we look in the direction of Northeast Arkansas, I’m seeing banks from Batesville to Paragould to Forrest City to Stuttgart – if you want to cover that swath – I see them expanding in other parts of the state. What do you see in Northeast Arkansas as far as banking growth? Franks: We’ve seen a lot of growth in Northeast Arkansas in banks coming into the city. There’s no longer a hometown bank in Jonesboro, which is unusual because when I was growing up all my years, there were always several local institutions with their main office there in Jonesboro. That doesn’t exist anymore. But we’ve seen a lot of growth in assets in Jonesboro over the last three to four years. Deposits have grown, assets have grown about $240 million in that area and in those institutions, so you’ve seen a lot of banks go into Jonesboro. I think it’s a place of opportunity in Northeast Arkansas. Brock: State government transformation appears likely to happen. The State Bank Department will come under the Department of Commerce umbrella. What do you think will happen as a result of that? Franks: Based upon what we’ve read and also conversations we’ve had with the governor’s office and other stakeholders in the process, I think the Bank Department probably will see business as usual once this transformation takes effect. The bank department has a unique mission and really a singular mission, and we’ve always run very efficiently in this office. What we do is important for the banks and for the citizens of Arkansas. Making sure we have a safe and sound banking system for people to deposit their money in. We’re 100% special revenue, meaning the banks pay 100% of our operational costs, and we always have tried to be good stewards of the bankers’ money when they pay for this agency to operate. I think that we’ll be able to continue our mission. Brock: Assess the health of the banking industry in Arkansas today. Franks: We’re seeing a lot of growth in assets. The State Bank Department regulated about $50 billion worth of total assets four years ago, and as of December 31, 2018 we went out with $100 billion in total assets that we supervise now, so we’re seeing an absolute explosion in growth. It’s not only from acquisitions to the four large institutions, but we’ve seen good solid growth in our smaller institutions as well. That has put some pressure on liquidity. That’s something that we always watch and that we’re monitoring, but really everybody’s doing well right now.